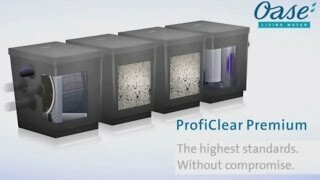 Click the individual videos to view more details on OASE's innovative ProfiClear Drum Filter System, Filtral, FiltoClear, Filtomatic, BioSmart & BioTec Screenmatic Pond Filters. 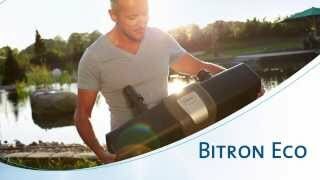 Also view the OASE Bitron Ultraviolet Clarifiers for effective pond algae removal. The automated filters from OASE featuring a rotating woven screen filter our debris before it even reaches the biological media. 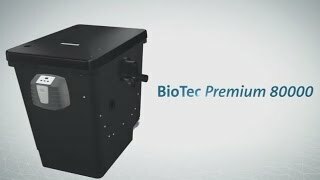 The BioTec Premium 80000 is a all-in-one filter from Oase, with both mechanical and biological filtering. 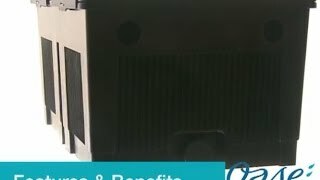 The video shows a variety of its features and compatible products. 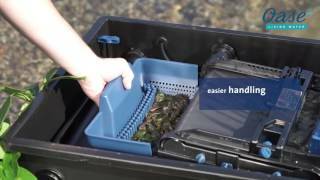 State of the art, automatic self-cleaning OASE drum filtration modular systems for large Koi ponds and goldfish ponds with pump and gravity inlet options. 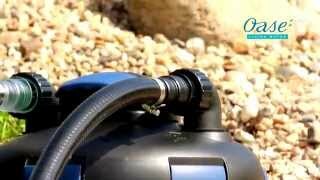 OASE FiltoClear pressurised pond filters with UVC. Suitable for burying and supplying a stream and featuring easy clean compression handle and dirty water outlet. 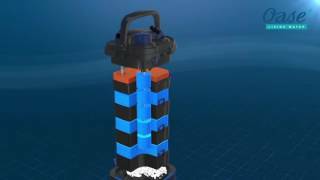 Compact, fully submersible OASE pond filters with integral ultraviolet clarifier. For small to medium sized fish pond. Talk through maintenance procedures for the OASE Filtral pond filters, covering assembly, installation and cleaning procedures. 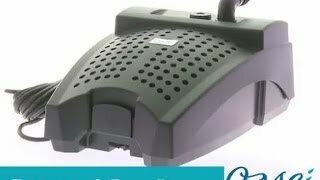 Economical gravity outlet flow-through filters for goldfish and Koi ponds. Features include thermometer, pollution indicator and cleaning back flush. 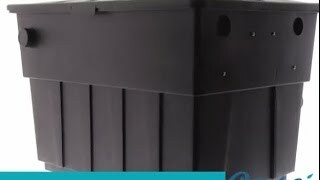 Large economical OASE flow-through pond filter for filtering ponds up to 30,000 litres, goldfish ponds up to 15,000 litres, Koi ponds up to 7,500 litres. Large OASE, media-rich flow-through pond filters with automatic debris screen, for larger goldfish and Koi ponds. Self-clean cycle every 30 minutes. Introducing the OASE Clear Water Systems range. 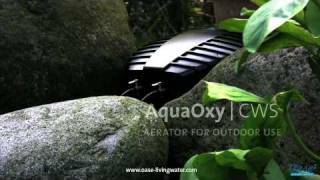 Products include FiltoMatic CWS self-cleaning pond filter, OxyTex biological aerator and SwimSkim floating skimmer. Oase Bitron C ultraviolet clarifiers. 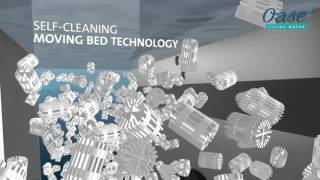 Featuring innovative flow bypass mechanism and flow-driven cleaning helix. For effective algae control on ponds of all sizes. 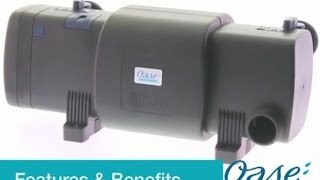 New OASE Bitron Eco UV clarifiers with power saving function and digital lamp life indicator. For pond up to 240,000 litres volume. 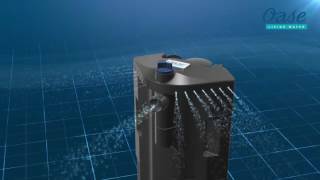 Oase BioPress Pressurized Filters. Designed to be buried for a discreet filtration system effective up to 10,000 litres. 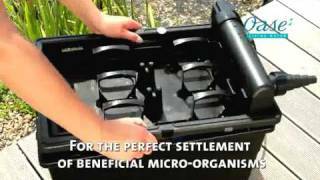 State of the art, modular, self-cleaning filtration systems for large koi and goldfish ponds. Featuring gravity and pump fed variations. 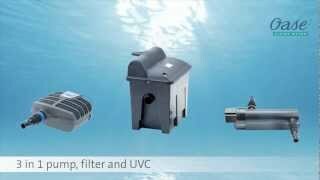 The Oase BioMaster filter is an innovative externally mounted aquarium filter. 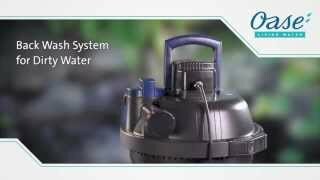 Featuring an integrated pump and the ability to filter up to 600 litres of water. The Oase BioPlus aquarium is designed with compact efficiency in mind. Featuring a removable, magnetic media module and 650L/h integrated pump.